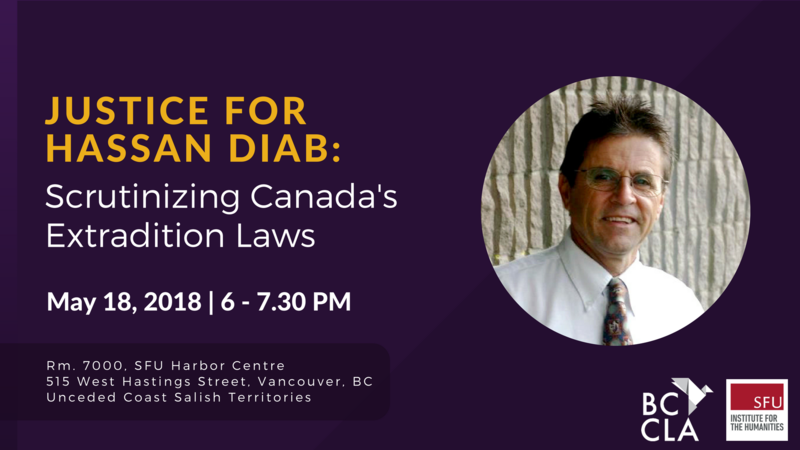 Hear: Dr. Hassan Diab speaking about his ongoing challenge to Canada’s Extradition Act and his unjust imprisonment. Hassan Diab is a Canadian academic who taught at various universities in Canada and the U.S. His life was turned upside down about a decade ago when he was falsely accused of an attack near a synagogue in Paris in 1980. Even though he was never charged, Hassan was subjected to imprisonment and draconian bail conditions for six years in Ottawa before he was extradited to France in 2014. He spent over three years in France’s largest prison. Hassan was ordered released on bail eight times by four different French judges because of consistent evidence of his innocence, however, each time the prosecutor blocked his release. On January 12, 2018, two French anti-terrorism judges cleared him and ordered his immediate and unconditional release. Soon after, Hassan returned to Canada and was reunited with his family including his son who was born after his extradition. A BCCLA free public event, co-sponsored by the SFU Institute for the Humanities. Note: No ticket required. This is a free and public event. We acknowledge that this event is located in Vancouver on unceded Indigenous land belonging to the Coast Salish peoples, including the territories of the xʷməθkwəy̓əm (Musqueam), Skwxwú7mesh (Squamish), Stó:lō and səlil̓wətaʔɬ/Selilwitulh (Tsleil-Waututh) Nations. Justice for Hassan Diab website. Justice for Hassan Diab Facebook group. BCCLA and Amnesty’s call for public inquiry.